Home » About Us » What is the Student Hub? We’re here to help the international student community! If you’re a visiting student living and studying in Cairns, you are welcome to visit the Student Hub and make use of our facilities. Visit the Student Hub to access free wifi, local information and support to help you make the most of your time while studying and living in Cairns. The Student Hub is located at Shop 2, 93-105 Lake St (School of the Arts, entry off Lake St). (Subject to Change). Please check the Student Hub Facebook page for up to date opening times. The facilities at the Student Hub have been designed by Cairns education and business leaders who understand student needs. We encourage Alumni, Academic and Professional staff, Study Cairns members and industry partners to engage with the student community through the Student Hub. We aim to offer learning opportunities, networking and social events throughout the year. Study Cairns manages the Cairns Student Hub by offering a supportive environment that aims to enhance the international student experience in Cairns. We aim to build a thriving student community by offering a safe and supportive place for students in the heart of Cairns city. The Student Hub provides a welcoming space for students to utilise to connect with fellow students, colleagues and the wider student community. 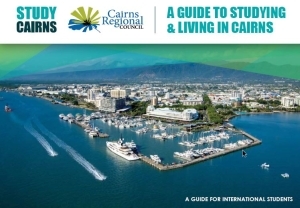 The Student Hub is an integral part of the Cairns International Student Engagement Program which improves the experience of international students studying and living in Cairns. It provides a connected network of touch points for students to feel supported and able to make the most of their time in the region.